Today we focus on invaders from Russia. And whilst in the Trumpian era those words may sound horrifying, fear not (unless you’re a fish). In today’s guest post by NINA researcher Odd Terje Sandlund, we look at the pink salmon, a species that has arrived from Russia in the last 2 decades and is now making its way into Norwegian coastal waters. Pink (or humpback) salmon (Oncorhynchus gorbuscha) is native to the northern Pacific, originally spawning in rivers from California and Korea in the south to Alaska and Siberia in the north. Pink salmon have a very a strict two-year life cycle; the offspring produced in any particular autumn will return to spawn two years later. One consequence of this is that there are two distinct types of pink salmon: odd-year and even-year spawners. Pink salmon eggs hatch in spring, and when the fry emerge from the gravel, they have already morphed into smolts, which allows them to leave the river for the sea after a few days or weeks, at a length of 35-50 mm. After spending a little more than a year in the sea, the fish mature and return to rivers. During the late 1950s, fertilized eggs of pink salmon from spawning stocks on Sakhalin Island (47 °N) in the Russian Pacific were transported to hatcheries on the White Sea in northwest Russia, close to the Norwegian border. Upon hatching in spring, the fry was released in White Sea rivers. The first return of spawners was in 1960, when pink salmon were recorded in relatively high numbers also in Norwegian waters. In spite of a total import of approx. 248 million eggs from the Sakhalin area between 1958 and 1984, the Russian aim of establishing self-sustaining pink populations in White Sea rivers did not succeed. During these years, almost all returning adult pink salmon to both Russian and Norwegian waters were the result of the Russian stocking program, with very few cases of natural reproduction. However, further introductions in 1985, 1989 and 1998, based on fish from further north in the Russian pacific, resulted in the establishment in Russian rivers of quite abundant odd-year stocks and less abundant even-year stocks. The subsequent appearance of pink salmon in Norwegian waters is a result of natural reproduction in Russian rivers in the White Sea area. Eventually, self-propagating odd-year populations of pink salmon were also established in rivers in eastern Finnmark. Where are they in Norway? Up to 2012, pink salmon had been reported from roughly 50 rivers in Norway, mostly in the northern part of the country. Pink salmon had also regularly been caught in the Svalbard area. Presently, a varying number of odd-year pink salmon regularly spawn in at least 12 rivers in eastern Finnmark, eastwards from the North Cape. Occasionally, fish would be caught in rivers further south. However in 2017, there was a formidable invasion in rivers all along the Norwegian coast, with more than 11,000 pink salmon being caught or observed in 272 rivers. Spawning was observed in many rivers along the coast. This last winter, fertilized eggs, fry with partly absorbed yolk sac, and fry in the process of smoltification, have been collected as far south as Bergen, and they have also been caught throughout northwestern Europe. It is likely that there has been a combination of favourable conditions in spawning rivers in 2015-16 and favourable oceanic conditions in 2016-17. The outstanding issue is whether the observed spawning and emerging fry in rivers south of Finnmark will result in establishment of populations of pink salmon, or if the warmer conditions in these rivers will result in a mismatch between the migrating smolts in the spring of 2018 and the conditions they meet in the sea. 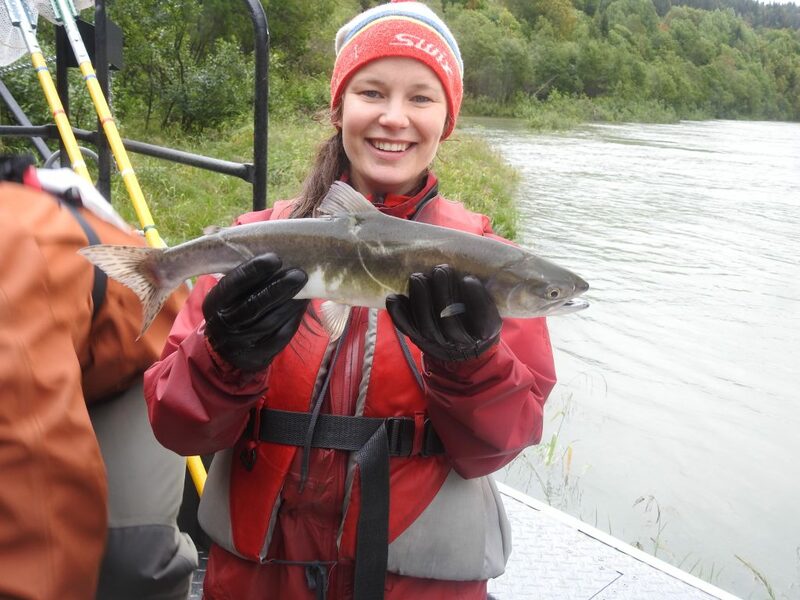 What is the impact of pink salmon in rivers? Pink salmon normally enter the rivers and spawn before sea trout (Salmo trutta) and Atlantic salmon (Salmo salar). They are, however, aggressive on the spawning grounds, and may stress and chase away the native spawners. 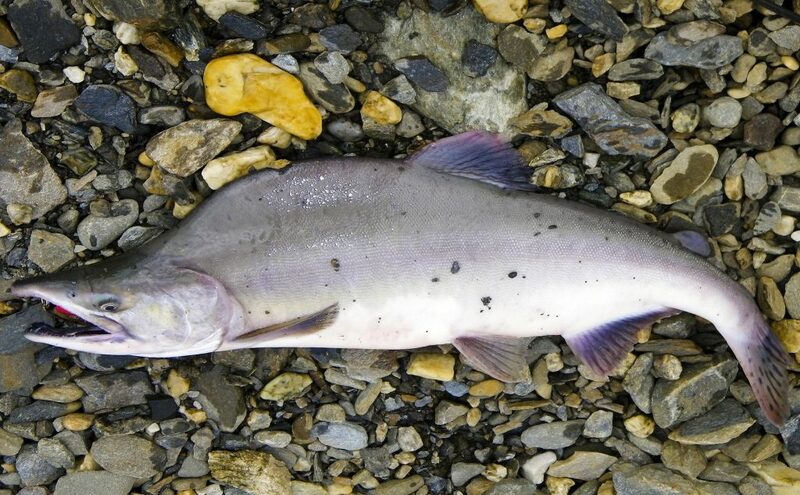 All pink salmon die after spawning, and whilst their decaying carcasses may contribute to fertilizing the river and cause increased production, it may also cause unfavourable oxygen conditions for the incubating eggs and alter entire ecosystems in unpredictable ways. The pink salmon hatch before the native salmonids, and on emergence from the gravel, the fry already have the coloration and partial shape of smolts. They start downstream migration after a few days, and therefore it has been assumed that they do not constitute serious competition with the juveniles of native salmonids. However, Russian scientists claim that pink salmon fry may remain in the river for longer periods, up to weeks, and that high densities of pink salmon fry do have a substantial negative effect on the density of Atlantic salmon juveniles. As long as there is successful reproduction of pink salmon in rivers in northwest Russia and Finnmark there will be a pool of potential invaders in the Barents Sea and the North Atlantic. The history of pink salmon in this region has demonstrated quite poor homing to the river where they were hatched. As the odd-year broodline has been most successful in this area, the number of potential invaders will be highest in odd years, but the number of pink salmon observed in Norwegian rivers in 2016 demonstrates that there is a potential also for the even-year broodline. The only management measures available to reduce this pressure are to catch as many pink salmon as possible before they are able to spawn. It may also be possible to destroy pink salmon spawning nests before hatching, but care must be taken not to destroy Atlantic salmon or brown trout nests, which may be located in the same gravel beds. To contact Odd Terje or read more about his research, click here. To read more about pink salmon, we encourage you to read the articles below.